Femmes et WC emerges from a simple question: Why do women often have to queue in public toilets whereas men do no encounter this problem? In other words: Why are there apparently less public toilets for women in proportion to their needs? Once we pose this question, others arise: Has it always been like this? Is it the same all over the world? What do people think, women and men? Are there initiatives that seek to find a solution to the problem? How can the experience of going to a public toilet become more equal between sexes? It is a question with deep implications, touching upon several fields, including architecture and the design of public space, the socialization of the body and its needs and gender relations. Modern female public toilets are relatively new. Even today in many developed countries the absence of female sanitary facilities in public space and buildings is a reality, and those that exist are often insufficient to meet women’s needs. Yet the « potty parity bills » passed in several states in the United States establish a minimum ratio of 2:1 between women’s bowls and men’s urinals. Enlarging space in women’s toilets by introducing more bowls is apparently the most logical and immediate solution, but is it the only one? Many experts question « the laws of urinary segregation » (Jacques Lacan) that reign over public life as something natural. In other words, the fact that women have to urinate sitting and men standing, and that we ought to do this in separate spaces. The idea of a female urinal has been picked up at different moments since the end of the 19th century, but has not been overly successful because of our gender differentiated toilet training. More recently, on the other hand, the use of disposable cardboard urinals (P-mate, Urinelle, etc.) has become relatively extended among women. Nevertheless, more and more people think that the solution to the inequality in public toilets is to create mixed or universally accessible spaces. The JC Decaux Sanisettes that were installed in Paris in the 1980s is a good example of this. If we ought to continue queuing at least it should be a democratic activity! ‘Liberté’, Lars Ramberg. Venice Biennale, 2007. 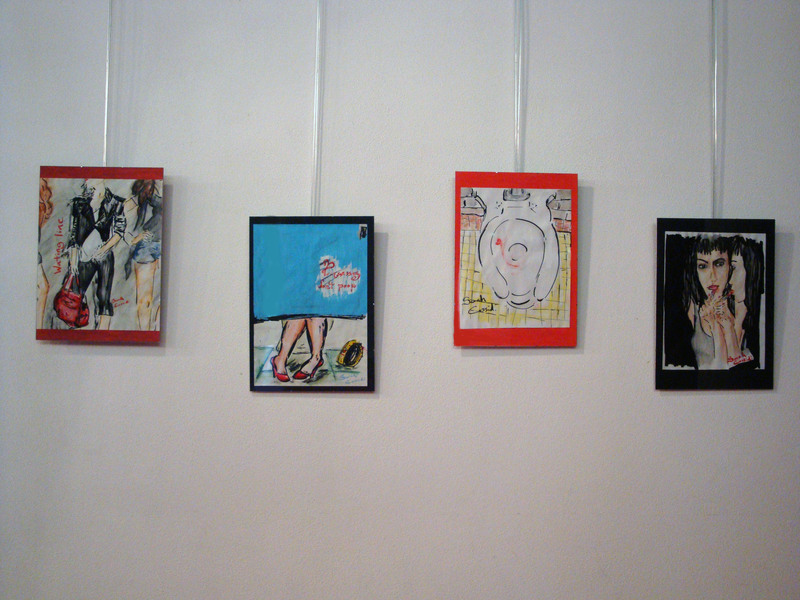 The first result of the project Femmes et WC is an itinerant panel exhibition that approaches the question from an interdisciplinary perspective, combining a socio-historical journey through the topic (conceived by Olivia Muñoz-Rojas) with artistic interpretations by Denise Cobello (with Florian Lasne and Caterina Carrá), María Alicia Flores, Cécile Gonzalez, Olivia Muñoz-Rojas, Abraham Sapién* and Maria Athina Tzioka. The art works in the exhibition were conceived by artists and researchers at the Cité internationale universitaire de Paris in response to a call for participation that was launched in March 2012 by Olivia Muñoz-Rojas and Maria Alicia Flores with the support of the Fonds des Initiatives Étudiantes du Théâtre de la Cité. 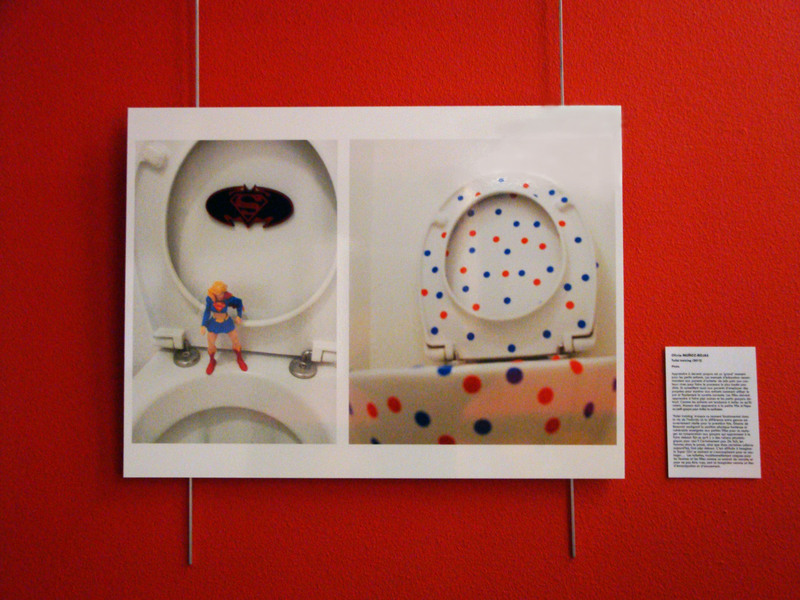 The works comprise different processes – photo, drawing, installation and performance – and are shown in the form of large-sized photographs.They offer critical, creative and often playful outlooks on the everyday challenges that women encounter in public toilets and the invisibility of the problem in our society. They invite us to reflect on the myths associated with women in relation to their natural needs and our toilet training during childhood. They ask us, finally, to think beyond “we and us” and “she and he” to get closer to an egalitarian, though not homogenous society. ‘Princesses don’t poop’, Sarah Cassidi*. Denise Cobello performs ‘Rituels de toilette’ at the Maison du Mexique, 29 May 2012. Exhibitions were held at the Maison du Brésil, Maison du Mexique, Maison des Étudiants Suédois, and the Maison Internationale during the spring 2012. The opening of the exhibition at the Maison du Brésil featured a talk by architectural historian Mary Vaughan Johnson with the title ‘La pissotière de l’Impératrice’, and the launch of Denise Cobello’s performance ‘Rituels de toilette’ conceived in collaboration with Florian Lasne and Caterina Carrá. During the exhibitions, there were several screenings of Paromita Vohra’s compelling documentary Q2P. The ‘finissage’ at the Maison des Étudiants Suédois featured a talk by Dr Barbara Penner (The Bartlett, UCL) with the title ‘Why are we waiting? Women, Protest, and Public Conveniences’. The project received logistic support from these same Maisons/Houses and funding from the Fonds des Initiatives des Étudiants du Théâtre de la Cité and the University of Westminster. Paromita Vohra kindly gave us permission to screen her documentary Q2P (since available on YouTube). ‘Femmes et WC’ par Herman Flore, Maison du Brésil, 01/03/2013. ‘Pourquoi les femmes doivent-elles souvent faire la queue pour aller aux toilettes?’, CIUP, 12/04/2012. British Toilet Association. Femmes et WC, 27/03/2012. Rituels de toilette / Toilet rituals, Racines de poche. Théâtre de geste et de parole. Driscoll, Brogan, ‘Everybody’s Talking About This Gender-Neutral Bathroom Sign – Here’s Why’, The Huffington Post, 13/05/2015. Kohli, Sonali, ‘The future of bathrooms’, Quartz, 13/05/2015. Bouriaud, Manon, ‘Si le logo des toilettes de femmes cachait en fait une super-héroïne’, Le Huffington Post, 04/05/2015. Pereda, Cristina F. ‘Los baños unisex de la Casa Blanca’, El País, 24/04/2015. Martínez Cantera, Ángel L., ‘El plan de los 120 millones de retretes’, El País, 17/02/2015. Muñoz-Alonso, Lorena, ‘Is Toilet Art Having a Moment?’, artnetnews, 20/10/2014. Frémaux, Philippe, ‘Pour la parité dans les toilettes’, Observatoire des inégalités, 04/09/2003. La toilette, naissance de l’intime, Muséé Marmottan Monet, Paris, 12/02-05/07/2015. Toliet?! Human Waste & Earth’s Future, Miraikan (National Museum of Emerging Science and Innovation), Tokyo, 02/07-05/10/2014. The Toilet Gallery, Rotterdam, Netherlands. Muntadas, Ladies & Gentlemen [photos], Actar, Barcelona, 2001. Museo del Orinal, Ciudad Rodrigo, Spain. Sulabh International Museum of Toilets, New Delhi, India. Beauvoir, Simone de, Le deuxième sexe, Paris: Gallimard, 1949. Damon, Julien, ‘Les toilettes publiques: un droit à mieux aménager’, Droit social 1, 2009. Elias, Norbert, La Civilisation des moeurs, Paris: Pocket, 1974. Molotch, Harvey & Norén, Laura (eds) (2010), Toilet: Public restrooms and the politics of sharing, New York: New York University Press. Penner, Barbara, & Gershenson, Olga (2009). Ladies and Gents: Public Toilets and Gender. Philadelphia: Temple University Press. Yomtow, Nel (2012), The grimy, gross and unusual history of toilets, Mankato, MI: Capstone Press.